HR is becoming increasingly complex, and no two businesses are facing the exact same challenges. That’s why Paychex gives you choice when it comes to HR services. So whether you’re an HR professional looking to streamline administrative tasks so you can focus on more strategic work, or a business owner needing more comprehensive outsourced HR management services, our unique combination of powerful HR technology and expert support can help you achieve your goals. Attract talent with a Fortune 500-caliber benefits package, including retirement and group health insurance. * Then manage your plans with ease, with our online benefits administration system. Develop your workforce and gain insights for better business decisions. All your HR information is securely housed in a single database, fueling in-context analytics throughout the platform. Gain the peace of mind that comes with support from highly trained HR professionals. Whatever your needs, we offer a service level to meet them — whether it’s a quick answer about a job description or new regulation, or a dedicated HR professional who helps you create an HR program for your company. Better understand your obligations under applicable employment-related laws and regulations such as the Fair Labor Standards Act, workers’ compensation insurance, OSHA guidelines, state unemployment insurance, COBRA, and more. Training and development are keys to motivating, engaging, and retaining employees. Besides instructor-led training from an HR Professional included in Paychex HR Solutions and PEO, our learning management system (LMS) gives your company access to a catalog of online courses, as well as the ability to incorporate your existing trainings and create your own custom courses, videos, quizzes, and reminders. Manage everything related to your people — from onboarding to retirement — from one cloud-based HR solution. 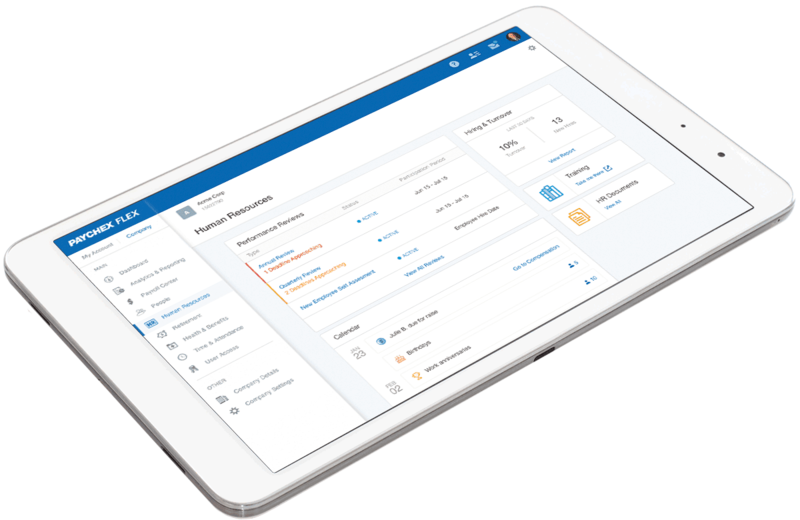 Give employees access to their payroll, benefits, and retirement plans from their mobile device. *Insurance sold and serviced by Paychex Insurance Agency, Inc., 150 Sawgrass Drive, Rochester, NY 14620. CA License 0C28207.